The former lead singer of Black Uhuru, with chart topping hits including the monster hits One Blood and This is Why I'm Hot (remix), Junior "One Blood" Reid is a worldwide Reggae/Dancehall Legend, universally loved and respected by fellow artists and fans. In 1989, Reid left Black Uhuru and released the One Blood album, whose title track became a worldwide anthem. Reid's longevity has a lot to do with the timelessness of the song One Blood. This song's universal message is similar that of Bob Marley's One Love. The One Blood remix with Game crossed over to hip-hop and urban audiences, leading to a string of hip-hop/ reggae collaborations with the likes of Poor Righteous Teachers, Busta Rhymes, Wu-Tang Clan, Guru's Jazzmataz, Alicia Keys, Lil Wayne, Cool and Dre and Snoop Dogg. Reid has a current video release with Junior Reid and Casidy called I'm so Crazy. His collaboration track Ancient Loveon Naz and Junior Gong's latest CD release has sold phenomenally. Other of his current successful singles include State of Emergency, Love your Brother, These Streets Belongs to Me and I just Love Jamaican Chocolate. Reid has one of the hottest nightclubs in Kingston Jamaica called Junior Reid's Nightclub, The View and the Spot. Reid's video release, The Real O.G. (Jordan Tower Films), released online on in October 2009, received over eight million views in the first week. The Real O.G. song itself was produced by Blackout Movements and JR Records. In 2007, Junior Reid won three major music awards in Jamaica. November 2007, he was featured on the American Music Awards with Alicia Keys on prime time American television. One Blood was sampled by The Game for It's Okay, and features Junior on the #1 hit off of The Game's latest album. Junior is also featured on MMS remix to the chart topping singleThis is Why I'm Hot. This single was a number one song on the radio and in the clubs, and the video was on heavy rotation on BET. He also featured on a Fabulous track with his song Real Gangster Don't Play. July/ August 2008, alongside the Reggae Angels, Junior Reid toured the Western U.S., culminating in top billing backed by Sly and Robbie on the Reggae Rising festival in Humboldt, CA. Shortly thereafter Junior Reid and the Reggae Angels toured Europe, doing most of the major summer festivals in many European countries. Junior returned to the US to headline the Monterey Bay Reggaefest in California. In 2009 he was a top billed artist on The Sierra Nevada World Music Festival. Junior's live show is in excellent shape with a repertoire of hit after hit songs. His sons Andrew and Wada Blood are also hot, up front, born and raised in the music business. Junior's One Blood band is clicking and shocking. Junior Reid and his One Blood band are definitely ready for action. 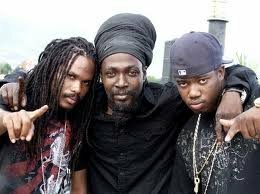 To date, Jamaican-born singer Junior Reid, a devout Rastafarian regarded by many as a messenger from Jah, is best known for the hit singles Foreign Mind, One Blood, Boom Shak-a-Lak and Listen to the Voices. He also served as the lead singer for the Grammy Award-winning Reggae group Black Uhuru. district of West Kingston. Junior began his career at an early age, gaining his initial inspiration from a tough upbringing. He recorded his first single, Speak the Truth at age fourteen for the late singer Hugh Mundell. His second release, Know Myself was released in the UK on the flip side of the Hugh Mundell 12 inch, Can't Pop No Style, on the Greensleeves label. He then went on to form his own band, The Voice of Progress, and after a local hit with Minibus Driver, the group's success was established with the album of the same name. At the age of eighteen, Junior was asked to join Black Uhuru as lead singer. The group completed their transformation to international status while he was a member, nominated twice for a Grammy Award in the Reggae category. After many changes in the music business, and an agreed separation among the members of Black Uhuru, Junior returned to the solo arena and started his own production company, J.R. Productions. Once again a solo artist, Junior recorded a number of songs for J.R. Productions and Sugar Minott's Youth Promotion label, enjoying considerable popularity with tracks such as Human Nature, A-1 Lover, Uplifting and Proud Statement. 1988 saw the release of Junior's first solo album, One Blood. The One Blood single was remixed by Paul "Trouble" Anderson and released worldwide on Big Life/Mercury Records. That track and Long Road received nominations for the prestigious Caribbean Music Awards and the Jamaica Music Industry Awards. He won awards for Best Album, Best Single, Best Song and Most Conscious Lyrics at the Jamaica Music Industry Awards. The follow-up to One Blood was the album Visa, which was distributed by the Greensleeves and Ras labels in addition to his J.R. Productions label. During his music career Junior Reid has performed around the globe from Bermuda to Japan. He has proven to be a durable and popular entertainer on the world stage. In 1993, after a winning performance in Jamaica at the Montego Bay Superfest, Junior toured Europe alongside Sugar Minott, the 809 Band, and Dub poet Mutabaruka. Junior was also featured in the biggest one-night show in Jamaica, the Sting, from 1996 to '98. Following exceptional performances at Sting and other shows, he was offered a starring role in the Jamaican film 'Klash', produced by Billy Parker. In 1997 Junior produced the album True World Order. He performed on the True World Order Tour in the United States and United Kingdom. He also teamed up with Busta Rhymes and Bounty Killa to record the hit single Change Like the Weather. He recorded the single Dreadful Day with rappers Poor Righteous Teachers and, joined by the artist Cannibus, recorded the song Frounsi Sound Bwoy for the Universal label. and newspapers and performed extensively internationally. In a producing role, Junior has lent his talents to various other artists. Early on, he worked with Dennis Brown, Gregory Isaacs and the Mighty Diamonds to name few. More recently, he has produced Andrew & 'Wada Blood (his sons), Elephant Man, Delly Ranks, Luciano and Anthony B. Reid has worked closely with Rap artists such as Wu Tang Clan, Goroo from Gangstar, the Absolute Beginners (from Germany) and Cold Cut. In the year 2000 Mr. Reid/J.R. Productions distributed the Emanuel Calling album, featuring the songs Mashing Up the Earth, John Law and Trod Up A-Zion. He toured the United States and Caribbean, garnering raves. In 2002 Rasta Government was released. Lost Vinyl Classics was released in 2005. This compilation of singles has sold exceptionally well. The cover artwork is a classic. Junior's new album Junior Reid, the Living Legend is scheduled to be released in early 2010. With his incisive, prophetic lyrics and unstinting support for the ghetto man, Junior remains a powerful roots artist well known and loved worldwide. Now in 2009, he is picking up his pace. He has numerous great songs recorded, still un- released. Junior Reid is hot.